In the wake of Microsoft’s unveiling of the Xbox One, gamers were left disappointed by the lack of in-game footage and title announcements. Although games are supposed to be more forthcoming at next month’s E3 part of the demonstration indicated huge potential for the future of the console’s content. Steven Spielberg will be creating a TV series based on the Halo games and it’ll be exclusive to the Xbox One. This signals Microsoft’s entrance into the content creation market and aligns them with the likes of Netflix who recently broke into the market with House Of Cards and the upcoming fourth series of Arrested Development. The Xbox One’s media will also be going up against Youtube’s premium content. There’s every chance that Microsoft will partner with one or both of these, currently Netflix is available on the 360, but it shows the level of competition they’re setting themselves by leading with such a big name director and franchise. Online, the fragmentation of content is fairly easy to navigate. Even if Microsoft don’t partner with Netflix or allow the browsing of Youtube, however unlikely that might be, it’s still possible to access either site via the home computer. It becomes more of an issue when compared to the existing separation caused by having to pick a broadband provider and accompanying TV package. As it currently stands, the content you can watch is limited by how much you’re prepared to pay for it, whether the total package you want is actually available in your area and whether you can put a satellite dish on your building or pipe a cable through your wall. The content itself is shared fairly evenly among the providers with things like sport franchised out to any company with the money for the uptake. But as television providers strive to acquire customers from their competitors, the appetite for unique content and programming has increased. 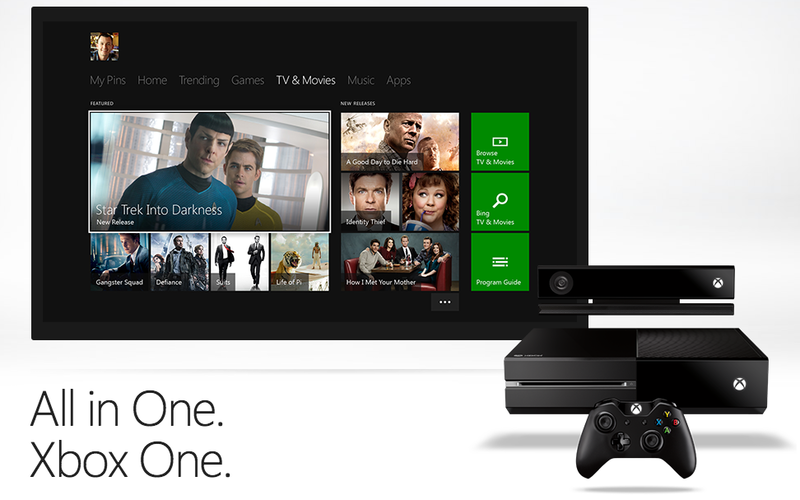 Xbox One becoming your home media solution? Microsoft’s entry into this arena would be less of a concern if it wasn’t being pitched as a replacement for the current home media set-up. It’s ‘pass through’ HDMI connections, Blu Ray player, voice control, ‘Snap Mode’, Skype, 24/7 internet connection and unique content could render every other appliance redundant including the home phone and set-top box. Ultimately more competition is a good thing and should drive prices down but considering a user can only have one television provider they would then have to choose based on the programmes they want to watch as opposed to the quality of the customer service or the reliability of connections. In a time when we have the most choice available, we actually have to decide what we don’t want to watch as much as what we do. As the channels split, so do the audience figures. Less people subscribed to each provider means less in advertising and therefore less in revenue. Budgets for TV programs could well decrease as a result. The business model Netflix have been trialling on their unique content is interesting, as it belongs to them they can host it for as long as they want and users can view it on demand, unlike traditional programming. Whether this is a successful revenue stream is yet to be seen but is likely to be the way Microsoft go with their content. As yet no-one has properly harnessed the potential of televisual content in the cloud. Apple have made decent strides with iTunes via their later operating system functionality but despite predictions from TalkTalk that 2015 will see 14 million jobs supported in the cloud, content providers seem reticent to explore it. With Google’s Youtube and Microsoft’s Xbox already engaged and Amazon set to produce their own set top box, how long before the other super companies (Apple and Samsung) get involved?